On July 31 of this year, we lost one of the greats in wrestling. 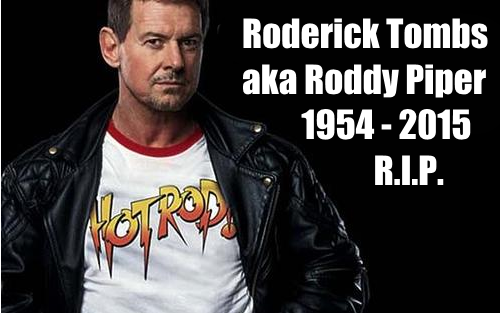 Roderick George Toombs, AKA the wrestling personality known as “Rowdy” Roddy Piper, passed away in his sleep. Although he was one of the most infamous bad guys during his heydey in the 80’s, there was just something about Hot Rod that endeared us to him, even if we were supposed to root against him. Roddy Piper was just too likable to hate. It might be because the first time I saw Roddy Piper, he was a good guy! The very first match I saw Hot Rod was in Wrestlemania III. I wasn’t a huge wrestling fan at the time but, one fateful evening, I just happened to be changing channels and I came across the event. One of the local channels was just showing it and I was curious. There were a lot of fans cheering and booing for people and there was a lot of action happening. So I decided to go watch. And I was instantly enamored by it! This was my first time watching wrestling and it just so happened it was one of the best Wrestlemanias ever! I got to see an epic match between Randy “Macho Man” Savage and Ricky Steamboat. I cheered for Hulk Hogan when he finally bodyslammed Andre the Giant. Even if Wrestlemania III will probably be remembered for those two matches, I also can’t forget how Piper beat Adrian Adonis with the help of Brutus “The Barber” Beefcake! After they showed Wrestlemania III, the channel oddly decided to play Wrestlemania II. It’s seems really weird that they were playing the Wrestlemania events in reverse order but my child brain didn’t care! I just wanted to watch more wrestling! And I saw Piper in a boxing match with Mr. T? Wait, Piper was the bad guy here? I didn’t know it at the time, but “Rowdy” Roddy Piper was one of the top heels during his initial start with WWF. I understand why he was extremely hated at the time. He was the WWF’s top bad guy/heel wrestler for good reason! He was a loudmouth and Vince McMahon (Sr. or Jr?) knew Piper could talk. So they gave him his own “talk show” called Piper’s Pit. In one very infamous episode of Piper’s Pit, Hot Rod managed to, not only insult Jimmy Snuka’s Fiji heritage but smash his head with with, of all things, a coconut! Even so, Piper managed to transition from being one of the WWF’s biggest bad guys to being one of their major faces with very little trouble. Like I said, there’s something just inherently likable about “Rowdy” Roddy Piper’s in-ring persona which made fans accept him as a good guy with no problem. What makes this more amazing is that he didn’t change his personality! Throughout his entire wrestling career, he stated the same brash and insensitive loudmouth! I don’t think any other wrestler could’ve succeeded in that aspect! But Hot Rod did! But while most wrestling fans will remember Piper as one of wrestling’s greatest characters, I’ll also remember him as one heck of a B-movie actor. And I mean that in the best possible way! While he never reached the same heights as Dwayne Johnson, he has at least a couple of movies that will be immortalized in B-movie history forever. These would be Hell Comes to Frogtown and Body Slam. However, if you could only watch one “Rowdy” Roddy Piper movie in your lifetime, you really should pick up They Live! It’s a cult classic for a reason! It was such a joy to watch “Rowdy” Roddy Piper in the ring, even during his later years! Even if he couldn’t really take a tumble in the ring anymore, whenever Hot Rod made a guest appearance in (now-renamed) WWE, fans, both young and old, would get excited! But you could actually see he was losing his stride even then. He seemed slower and confused at times but he was still trying to be the brash and cocky windbag he was way back in the first Wrestlemania. And, even when he did lose a step, he was still a much better speaker and could still out-promo a lot of the younger Superstars in the WWE any day of the year! He was just that good. So, RIP “Rowdy” Roddy Piper. You will be missed greatly. Another great is entering that glorious ring in the sky. How will you remember “Rowdy” Roddy Piper? Let me know in the comments section below.